While there are many foods that people generally like, fish is one of the most polarizing due to the taste, texture and smell of the products. For all of the seafood fanatics, this year's pink salmon supply in Washington state is proving to exceed expectations for local anglers and cold storage facilities. The unprecedented numbers will provide a substantial amount of fish for the market and keep salmon lovers content throughout the season. There have been many warnings about overfishing and declining habitats for fish, however, this caution was thrown to the wind as an unusual amount of pink salmon populated the Nisqually River. Some Native Americans who live in the area have declared it the "year with pink salmon," estimating the population to reach one million in the coming days, according to the Nisqually Valley News. Many are saying this will be a once-in-a lifetime event and marks progress in salmon restoration in the region. "The bottom line is the habitat in this watershed is better than it's been in 100 years ... So the goal with this project is to remove that hatchery component and allow the natural fish upstream simply to adapt to the Nisqually River and become wild over time," David Troutt, the Nisqually Indian Tribe's natural resources director, told the news source. Close to the Nisqually River, the Bellingham Cold Storage is also benefiting from the increase in salmon. The cold storage facility received hundreds of thousands of pounds of salmon every day recently, making temperature monitoring systems crucial to maintaining the fresh fish during processing and shipping, according to The Bellingham Herald. The salmon runs allowed by the Pacific Salmon Commission are credited as the reason for the amount of fish populating the area. Due to the organizations' efforts, the most recent run size estimate in the Fraser River increased to 24 million, accounting for the drastic increase. "We're all hands on deck right now," Bellingham Cold Storage CEO Doug Thomas told the news source. "We've produced and sold more ice than ever before - well over a half million pounds of flake ice each day." The growth in available fish is a reminder that the proper methods must be taken to store and prepare seafood. With a temperature sensor, making sure that salmon is kept as close to 32 degrees Fahrenheit as possible will help consumers store the fish twice as long, according to the National Oceanic and Atmospheric Administration. Storing the fish at 40 degrees will thaw it quicker and affect the quality of the fish. The NOAA also recommends rinsing the fish so that the flesh doesn't deteriorate as quickly. Putting it in a pan with ice will help keep it from thawing and preserve the taste and appearance of the salmon. 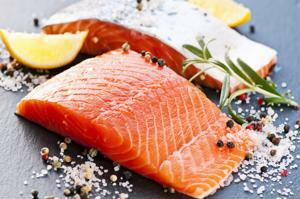 As with other meat products, preparing and storing salmon accordingly will bring more satisfaction to consumers. The excess of fish this season is a great benefit for seafood lovers and keeping the fish in appropriate conditions will make it more enjoyable.